WINNER UPDATE – Congratulations to Patti Neville – this weeks lucky winner! WHY NOT WIN WEDNESDAY IS HERE!!! There is nothing better than giving away a little something something on HUMP DAY! Some energizing excitement to get you through the rest of the work week until you can SCRAPBOOK all weekend long!!!!! This week we are so excited to be partnering up with Simple Stories. They will be giving away one of their latest collections called Vintage Blessings. This collection is absolutely stunning and perfect for your next scrapbook page, card, paper craft or planner. While I was visiting the Simple Stories blog – I came across this beautiful planner featuring the Vintage Blessings Collection. Simple Stories is definitely famous for their assortment of planner supplies and for the talented designers who feature their products. Emma Toon’s design is no exception. 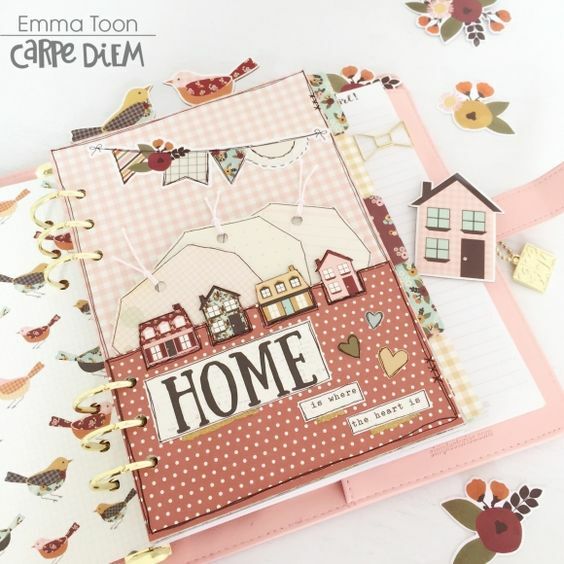 Be sure to visit the Simple Stories blog to see all the details of Emma’s planner – inside and out. She put the planner together using a wide array of products from the collection – including patterned papper, die cuts, clips, album and MORE! The Simple Stories blog has a ton of detail photographes giving you an up-close look at all the elements of this planner and the collection. CLICK HERE to visit the Simple Stories blog – you will love what you find. WIN WIN WIN the Vintage Blessings Collection from Simple Stories. Why not eh??? Someone has to win – why not you? Leave a comment right here under this blog post.!!! IT IS SO DARN EASY!!!!!!!! You have until Friday Sept 8th at midnight to enter to win. Subscribe Today to Creative Scrapbooker Magazine – HOLD IT! READ IT! LOVE IT! Simple Stories is hands down my favorite paper company. I love every collection ever made. Everything about them, right down to the smell of that beautiful paper!! LOL!!! Love this paper collection! Love all things vintage!! Thanks Simple Stories! A lovely collection. Whoo hoo for a chance to win something from one of my favourite paper lines with my favourite magazine -truly a marriage made in heaven! Thank you Simple Stories and Creative Scrapbooker for the chance to win. What a sweet collection and awesome prize!! Wow, I need this collection for my Homemaker’s scrapbooks. WOW !! I would love to win ! I’m getting excited for our extra long weekend (4 days) of Scrapbooking in October at my cottage with friends. I could make them jealous with my prize. I love Simple Stories! Good luck everyone! Love the colours in this collection! Good luck to all! Love it. Would go perfect with recipes or for actual vintage photos, both of which I plan to work on soon! Simple Stories makes such beautiful paper! A girl can never have too much pretty paper!! Thank you Simple Stories for the wonderful paper prize pack.,and thank you CSM for your super contests. Such sweet papers. Love ❤️ them! Another wonderful collection from Simple Stories. Simple Stories continues to impress me; this collection is stunning! Thanks for the chance to win such a gorgeous prize!! Love Simple Stories!! WOW! Awesome papers. Love the colors and the pattern. Oh my goodness!!! Love so much Vintage Blessings collection!!! Great prize!!! Hello, would love a chance to win this Vintage Blessings collection from Simple Stories. What a beautiful paper pack! And what a great issue of Creative Scrapbooker that arrived last week. It is hard waiting 3 months between issues. Please can I win just one time? I would love to win this gorgeous set!!! Simple Stories rock! This is such a beautiful set! Love the colors and patterns! Thanks you for the opportunity! Sure! I would love to win on this lovely Wednesday. 🍁🍂🍃 Thank you CSM & Simple Stories. An absolutely gorgeous collection….as are all things Simple Stories! Thank you for the giveaway opportunity! I left a comment on their IG photo of the carpe diem planners…so beautiful! Awesome giveaway. Love Simple Stories products and love all the inspiration from the CSM team. I just bought this collection for myself and would LOVE to win it for my mom! It’s simply beautiful. This collection is absolutely adorable!! I love all the pink used. Thanks for the chance to win!! Great collection! Thanks for the chance to win. I love Wednesdays! Beautiful! I love this connection! Sooooo cute – can’t wait to use these in my scrapbooking!! Absolutely beautiful collection with just my colours! Thanks so much for sponsoring such a splendid giveaway Simple Stories!! What an absolutely gorgeous collection! Love Simple Stories! What a great prize. I love this collection, such generous sponsor! This collection is beautiful. Love some of the samples using this and the Christmas collection too. I can never resist Simple Stories collections! I just love this Vintage Blessings collection!! Thanks for a great giveaway! Ooh, those look so pretty! I’d love to win, thanks for the giveaway! I visited them on Facebook. Thanks for the chance. I love this brand!! Beautiful paper! Love simple stories! That is an awesome collection. A card maker/scrapbooker can never, ever, have too much paper or embellishments – that’s my story and I’m sticking to it. Love all Simple Stories designs! Simple Stories consistently produces beautiful products in the most luscious colours! Gorgeous colors! Love Simple Stories product. These are pretty papers. Thanks for a chance to win. Beautiful collection. Thanks for the chance to win it. This is a great looking collection. I hope I win it!! Looks like a great pack, love the colours! I love this paper collection. ..
Vintage blessing is appropriate with all the world happenings this week. Yea!! Another chance to win a wonderful collection. ❤️ Simple Stories products! Thx for the chance 2 win!! Thanks for offering this great prize! Simple Stories is my absolute favourite!!!! Thanks for Why not win Wednesday! Beautiful @Simple Stories. Collection. Love CS and Simple Stories! Love this new collection. I love Simple stories! Wow, I think every one would love to win this. Love this collection! Thanks for the opportunity! the Vintage Collection is beautiful. I would love to use it for my greeting cards. I think this is just the prettiest collection. Love the colors, love the theme. Thanks for the chance to win; it is very much appreciated! ❤️❤️❤️Thanks for the chance! ❤️❤️❤️ Simple Stories!!! What amazing papers and package! This collection is perfect to start my paper scrapbooking back up. Did the digital Project Life and miss touching all the beautiful papers and embellishments. It was like trying to read on a Kindle -I missed the experience of actually holding something in my hands and having a tactile connection. And besides that – I miss the bling! This is an awesome giveaway! Thanks for the chance to try to win it! Thanks for the chance to win this wonderful prize! This is such a gorgeous collection! I just love everything that Simple Stories puts out. Thanks for the chance to win! Such a nice collection. I would love to win! Thanks for the chance. Beautiful, thanks for the chance! Beautiful fall collection from Simple Stories. This is a beautiful collection and I’m in love with that planner! I love love love this collection!!! Love this collection and anything vintage. Love that all collections are beautiful. Thank you for this awesome chance..
Love this collection and I always love vintage! Thanks for the chance to win! Simple Stories never disappoints! Love it! It will give me inspiration to pick up scrapping again after a hard period…. I 💓 this! My hands are acing to get scrapping with these lovely papers! From Friesland, with love. I love this! Simple stories is amazing and this collection is beatiful! I would Love ❤️ a chance to win a Simple Stories Vintage Blessings paper kit. This looks like a beautiful designed paper to work with (as are all the other packs) some great products and designs one of my favourite designes. It’s a beautiful collection and it makes me feel creative seeing this beautiful colors! Stopped and said hello from me and you CSM. That collection looks so lovely – I would be honored to win this prize. Tons of fall-photos are waiting to be scrapped! What a great giveaway! Thanks for the chance to win some awesome prizes, simple stories are one of my favourite brands! Love this collection….it’s homey and cozey and makes me happy! Thank you for the chance to win! Woohoo !!! I love being creative with Simple Stories. much for the awesome opportunity to win this giveaway. My fingers are soooo crossed to win this pkg. Love love love Simple Stories and this collection is my absolute fave!!! Love Simple Stories. Thank you!! Thank you for this contest. This is a beautiful collection. Simply gorgeous paper from Simple Stories! I’m a Simple Stories fangirl mostly their 6×6 pads, alpha sticker sheets and bingo card sheets. Love them ❤. Thanks for the opportunity to win. I love Simple Stories!! Done! Love this paper and you running this contest! This is stunning! Thank you for the chance to win! I love this collection! I am already following both sites!! Love Simple Stories and love their new Vintage Blessings collection. Thank you for having this contest for a chance to win. Such a pretty collection! Thanks for the chance to win this! What a beautiful collection! Thanks for the chance to win it! I love anything vintage and I love this collection! I visited on Facebook. What a lovely collection. Love this collection and Creative Scrapbooker! I’m so in love with this collection! It’s always fun to see the new Simple Stories collections! Love this collection! Can’t wait to see it in person. This is such a beautiful line! Fall is my favorite.❤️ Thanks for th chance to win! Love this collection, especially the birds. I love this collection from Simple Stories !! Would love to win it !!! This paper line is SOOOO ME! I love how it would be great for fall and isn’t so typical of a fall paper line!! I love SS and this collection is beautiful! Simple Stories is my go-to scrapbook product! Love it all, would love to win!! I love the the awesome line. Love both companies too. Great collection! I love the colors. Thanks! Love this collection, thanks Creative Scrapbooker and Simple Stories! Love the collection I have some ideas for this stuff. Thanks for the chance. Absolutely love simple Stories and Creative Scrapbooking! Thanks for the chance to win! Who doesn’t love a giveaway! These products are great but I would expect nothing less from Simple Stories. Thank you for making my crafting fun! Fell in love at first sight! This vintage paper is perfect! I love the planner cover! Love Simple Stories paper. Would love to win this!! Would love to win this collection! I love all things Simple Stories! Another wonderful collection from Simple Stories.. Thank you CM for the chance to work with this one! How exciting to possibly win Vintage Blessings Collection from Simple Stories. Love these products …so creative! Love it – the planner cover is so cute! Thanks for the chance to win. Planner inspiration is great. Great giveaway!! Thx for the opportunity! It would be an honor to win these beautiful papers. Love scrapbooking and all the wonderful ideas. Simply gorgeous papers. Thank you for the giveaway. Great collection! Would love to feature this one on my blog. Creative Scrapbook Magazine and Simple Stories…what a great collaboration! Simple Stories never disappoints, Vintage Blessings is a fabulous collection and I look forward to designing beautiful pages to share. Thank you. What a great collection. I love the patterns used and colors. I would love 💟 to win this great giveaway! I love the soft colors, it’s peaceful! Gorgeous collection by Simple Stories! love their products. Thank you for offering this beautiful paper from Simple Stories. So pretty! Would love to have that for my girl’s weekend scrap retreat coming up! I might even share! … maybe! I love Simple Stories and this collection is beautiful! I just love you guys! Simple Stories has the greatest collections and incredible quality as well. I’m vintage all the way! Beautiful collection!!! Simple Stories has wonderful paper designs! I have never seen this magazine but would love to win a subscription. I love reading all the items and now on the way to find the most current issue. Love love everything that’s Simple Stories! Love Simple Stories. Always such beautiful collections. Love ❤️ simple stories and love this collection specifically. Thanks for the chance. Love your products but this one seems to be what i need in my life right now,. Thanks and good luck all. Simple Stories is my go to. I love the collections and am super excited about the Vintage Collection. It’s so beautiful! Ohh this spelling corrector is terrible!!!! What an awsome giveaway!!! This collection is so pretty!!!! What an awesome giveaway. Thanks for the chance to win! I just love simple stories!! Thanks for the chance to win this amazing prize! I LOOOOOVE Simple Stories and their products. Thanx CS. Each and every time SS releases a new collection I am blown away with how versatile they are, not to mention knock out beautiful! Vintage is no eception. Thanks for the chance to win!! My all-time favorite “simple stories” awesome products! Love the Vintage Blessings paper line. Can’t wait to make a mini album! This is a great price. . . . Thank you for this opportunity. Love simple stories! have since they first arrived on the scrapbooking scene. Absolutely love Simple Solutions and this package is adorable! Would love to win! Thanks for the chance! Awesome collection. Would be great to add it to my stash. I have always been a huge fan of Simple Stories and fell in love with this collection when I first saw it on Simon Says Stamp! I would love to win it!!! !